We are now one month away from the Spring 2019 Forum! It will be similar to our past events that you have come to enjoy, just with a new name to better represent the content and overall quality that our attendees expect. The Forum will be held on May 9th at the University of Richmond in the Jepson Alumni Center from 1:00 to 5:00 pm. Plan to arrive at 12:30 pm for registration and extra networking time. We will kick things off with a business meeting, where members will participate in our 2019 Board Elections. Then, back by popular demand, we will issue a live poll to get your feedback on how we can make the VAEEC even more beneficial to our members. Not yet a member? That’s ok; we want your feedback too. Let us know what it will take for you to join our membership network. This year’s breakout sessions are Blending Technologies to Maximize Building Efficiency and Working Together to Increase Efficiency. The technologies panel will discuss how to achieve the right “blend” of old and new technologies to reduce energy use, as well as “future proofing”, or implementing technologies that allow buildings to keep up with the digital era. The working together panel will feature local government representatives and a higher education staff member who will discuss successful interactions between different departments to increase energy efficiency and to bring it into the IT realm. Join either session to learn and brainstorm how energy efficiency can advance even further in Virginia. Our final session of the day will be a collaborative, interactive session providing you the chance to influence VAEEC’s work for the coming years. 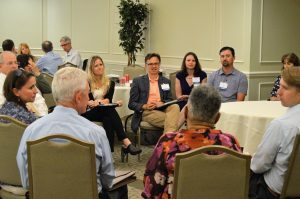 Similar to last year, attendees will self-select and join one of several breakout groups to discuss a variety of topics, such as local government collaboration and data access and smart meters. But new this year, attendees will get to select the topics discussed from a pre-screened list of ideas! 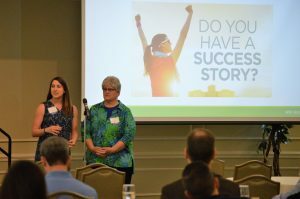 Recommendations and goals shared during this time will be used to lay the groundwork for the organization’s three-year strategic plan this summer. We can’t wait to hear your thoughts! One of the many benefits of a VAEEC membership is the chance to showcase your successes! 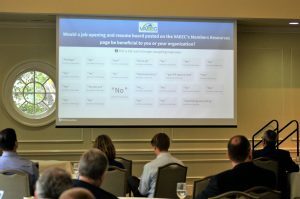 During the Remarkable Member Updates portion of the event, all current VAEEC members are invited to speak for up to a minute about any accomplishments you have achieved over the past year. Email info@vaeec.org by May 7th to secure your spot. We also invite all members to display your business cards and marketing materials on our Member Networking table, which will be conveniently located next to registration for all to see. Finally, don’t forget to register! Registration closes Tuesday, April 30th. The event is free for VAEEC members and $25 for non-members. Interested in becoming a member? Go to our Join page to learn how a VAEEC membership will benefit you and your organization. We look forward to seeing you on May 9th!